To order online with your credit card, input the number of each item you'd like, complete the form below and then click on the "Create Order" button at the bottom of the page. If you're wanting more than 5 different inscriptions, email me the inscriptions, I'll verify and then send you a secure link for payment. You will be taken to a verification page which you can check and then continue on to a secure server page to complete the order. Please enter the desired inscription (not to exceed nine characters) and the number of markers desired with that inscription. 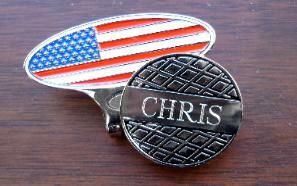 The order page allows up to 5 individual engravings. If you are wanting more than 5 (five) of one item, please email me the engravings you'd like and I'll send you a secure link for payment of the total. 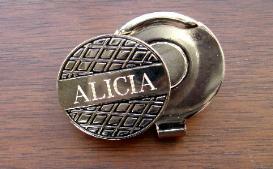 Any name or nick name you choose up to nine letters will be richly engraved on the ball marker’s surface –at no extra charge. 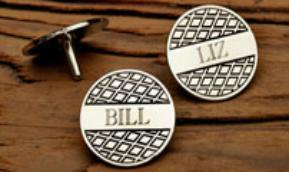 If ordering more than one, indicate the desired engraving on each. 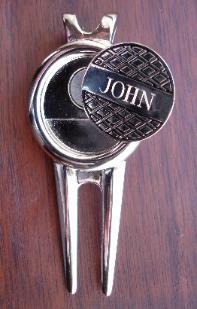 Each pair of ballmarkers will have the same engraving. magnet, packaged in a clear PVC pouch. makes ball mark repairs easy. $3.95. All shipments to United States locations will be sent as First Class Mail. States and Canada, the shipping charge is $6.95. All orders are normally shipped within two business days. If you're in a rush, we'll also ship overnight express for $19.50 within the US. If so, select "Ship EXPRESS" below.